Finely chop parsley. Add basmati rice and water to a medium saucepan and salt. Bring to a boil, then reduce heat and let simmer for approx. 20 min. or until rice is done. Add lime zest, lime juice and chopped parsley and stir to combine. Heat oil in a large frying pan. Add vegetarian ground meat and fry for approx. 4 min. Add soy sauce, red pepper and smoked paprika and stir to combine. Season with salt and pepper to taste. Drain water from can of black beans and rinse beans under clear water. Add black beans, mole sauce and salsa picante to a small saucepan. Stir to combine and heat up for approx. 4 – 5 min. Remove from heat. Pit and slice avocado. 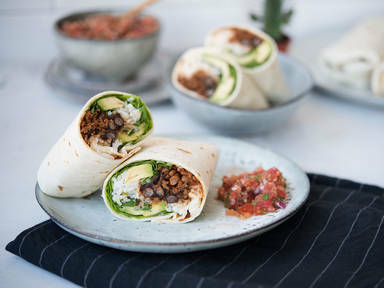 Top each wheat tortilla with lettuce, avocado slices, cilantro, lime rice, bean mixture and fried vegetarian ground meat. Roll tightly together and serve with red salsa. Enjoy!